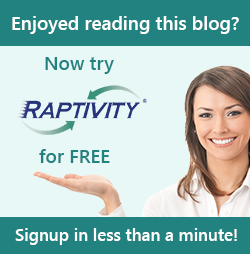 Raptivity - Rapid Interactivity Building Tool: Raptivity Integration with Captivate: What works and what doesn't? Situation:Direct integration doesn’t work. After adding the Raptivity output as animation it shows a blank screen.You need to use a shell for the integration. This shell is Flash loader which loads the Raptivity output.Resolution:Integration using Shell: Create a Captivate project. Go to Preferences à Publish Settings and check FMR SWF and Animation options (These are found under Externalize Resources).Separately, open Flash IDE. Create a new Flash project. Write Raptivity provided SWF loading code in the first frame of actions window. Compile this code to SWF format. This is your shell file. Back in Captivate, create a new slide. On this slide, insert the shell file as animation. Save and publish your project. Situation:Direct integration works as described here.Resolution: Direct Integration: Open a Captivate project. Navigate to any slide. Insert a button. Set the button click to open a URL or file. Navigate to the Raptivity SWF. Repeat with more slides, if required. Save and Publish the project. Situation:Direct integration works as described here.Resolution: same as Captivate 5. Situation: Audio works fine once you complete Integration using Shell as described above. Situation: If you add multiple Raptivity interactions in the same Captivate project, audio files can overlap. This specific issue is easily fixed with a Animation Widgetfreely provided by Adobe.Resolution: Open a Captivate project. Create blank slide. Insert animation widget. Upload Raptivity SWF. Set position and timeline. Repeat with more slides, if required. Save and Publish the project. Situation: Works fine. No need for widgets as far as we can tell, based on the interactions we have tested. Situation:Some animations exceed the boundaries of interaction. Some animations simply do not work.Resolution:Raptivity has been issuing fixes and workarounds on a per-interaction basis. Check with tech support. Situation:We have tried some interactions and the animations work fine.Resolution: If you encounter animation problems in any interaction please contact tech support, and we will explore alternatives.